Microsoft is planning to release and distribute a new update for Windows 7’s built-in activation and validation system (Windows Activation Technologies) as an intensifying of anti-piracy and anti-counterfeit effort. The new update will be delivered via Windows Update, with title of “Update for Microsoft Windows (KB971033)” by late February. The KB971033 can be individually downloaded from Microsoft Download Center starting from February 17, but will be available online on www.microsoft.com/genuine beginning February 16, 2010. According to Genuine Windows blog, the Windows Activation Technologies Update for Windows 7, this update will detect more than 70 known and potentially dangerous activation cracks or exploits. Activation exploits are sometimes called “hacks”, and attempt to bypass or compromise Windows’ activation technologies. Once installed, the Update protects customers by identifying known activation exploits that may affect their PC experience. If any activation exploits are found, Windows will alert the customer and offer options for resolving the issue – in many cases, with just a few clicks. Machines running genuine Windows 7 software with no activation exploits will see nothing – the update runs quietly in the background protecting your system. 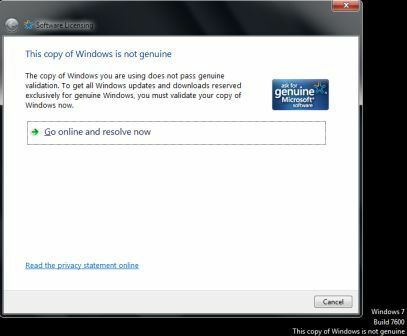 If Windows 7 is non-genuine, the notifications built into Windows 7 will inform the customer that Windows is not genuine by displaying informational dialog boxes with options for the customer to either get more information, or acquire genuine Windows. The desktop wallpaper will be switched to a plain desktop (all of the customer’s desktop icons, gadgets, or pinned applications stay in place). Periodic reminders and a persistent desktop watermark act as further alerts to the customer. Other that activation cracks and exploits, the main controversy of the KB971033 is that the update will “call home” to Microsoft every 90 days initially. The callback to the Microsoft’s activation server serves as an additional layer of periodic validation, which allows that WAT system to download latest and updated signatures that are used to identify new activation exploits in order to verify and determine whether the Windows 7 installed on a PC is genuine or pirated, and take various actions to change the user experience and behavior of the PC if the WAT decides that the system is not genuine or properly authenticated, even though the system is still activated at the point of the time. In short, KB971033 update for Windows 7 activation and validation system may not be the exploit detector itself, but just a introduction of mechanism with ability to establish authentication verification connections to central servers to download piracy signatures database from Microsoft as and when needed in order to combat new activation cracks or methods. By doing so, Microsoft can dynamically update WAT system, instead release complete update for WAT again in future. Luckily for pirated Windows 7 users, KB971033 Windows Activation Technologies update is optional and voluntary. It’s marked as Important update in Windows Update, and user can choose not to install the update. Initially, it will be rolled out to Windows 7 Home Premium, Professional, Ultimate and Enterprise editions. It should be available to all Windows 7 and Windows Vista systems in the end. After installed, user can still uninstall the KB971033 easily, however, once the system is flagged as fraudulent, not genuine, pirated or illegal, it will stay so despite the update is removed or uninstalled. In fact, KB971033 Update for Windows Activation Technologies have been leaked to Internet for everybody’s download since early February, and long discussion thread on My Digital Life forums has been debating on how far the update will go to invalidate and deactivate various cracks and hacks for Windows 7 such as loaders (softmod) and BIOS-mod (hardmod). As the update depends on online update for new signature, which does not seem to active or go live yet, so the actual effect of the update is not yet known. Most do however agree, based on Microsoft’s track records on WGA update on Vista platform, that the WATU (WAT Update package) will mostly deal with activation cracks which modify the activation or licensing files, such as Chew-WGA and RemoveWAT Win7 activation crack, and numerous other “derivative” cracks and exploits that may include virus or Trojan horse (hence the explanation for 70 odd exploits available in the wild). The update will attempt to repair core licensing system files that have been tampered with, disabled, removed or changed illegally, which effectively disable the activation hack.